Global business leaders looking for profitable growth and cost-effective access to new markets will want to read Motoring Africa. Local African business leaders looking to innovate and create new opportunities will want to read Motoring Africa. 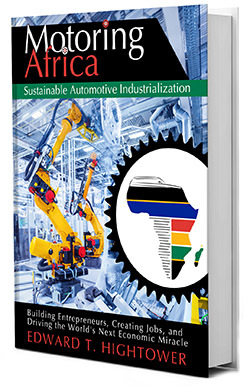 Local African government leaders looking to encourage investment and create jobs will want to read Motoring Africa. During China’s period of automotive industrialization, from 1990 – 2015, the country went from building 500,000 cars per year to over 25 million cars per year, a 50-times increase! China’s GDP increased by 27-times during this same time period. Motoring Africa proposes that advancing value-added manufacturing of complex products, like automobiles, in six selected African countries, is a financially viable way to serve these markets, while creating large numbers of opportunities for entrepreneurs, investors, and job seekers. Industrialization creates the conditions for efficient and profitable local manufacturing. Sustainable industrialization creates these conditions while maximizing the positive impact on the community and minimizing the negative impact on the environment. Sustainably industrializing automobile production has a job creation multiplier effect, given the 30,000 complex parts that must each be designed, engineered, and manufactured, by individual supplier companies, in order to create an automobile. Skills developed for the auto sector can be applied to other, less complex, consumer and industrial products. Motoring Africa is a forward-looking, action-oriented book written from my perspective as an industry veteran. Throughout my career as an engineering and business leader in the global automotive industry, I have helped automakers succeed in China, India, South Korea, Brazil, and Mexico. I have personally seen how automotive industrialization has helped transform the economies and living standards in these markets.